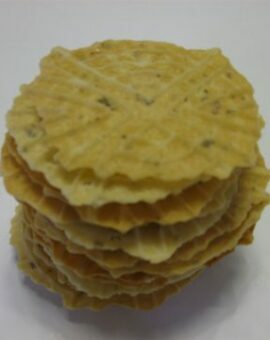 Classic salted wafers for use as a snack between meals or otherwise as an aperitif before meals. Olive oil, white wine, flour, salt. Pack of 200g. SKU: 037. Category: Savory waffles. Olive oil, white wine, flour, salt. Olive 'oil, white wine, salt, flour and fennel seeds. Pack of 200g. SKU: 031. Category: Savory waffles. Olive 'oil, white wine, salt, flour and fennel seeds. Olive oil, white wine, salt, flour, olive paste. Pack of 200g. SKU: 036. Category: Savory waffles. Olive oil, white wine, salt, flour, olive paste. Olive oil, white wine, salt, flour, rosemary. Pack of 200g. SKU: 033. Category: Savory waffles. Olive oil, white wine, salt, flour, rosemary. Olive oil, white wine, flour, salt, sesame. pack of 200g. SKU: 034. Category: Savory waffles. Olive oil, white wine, flour, salt, sesame. Olive oil, white wine, salt, flour, hot pepper. Pack of 200g. SKU: 032. Category: Savory waffles. Olive oil, white wine, salt, flour, hot pepper. Olive oil, white wine, salt, flour, oregano. Pack of 200g. SKU: 035. Category: Savory waffles. Olive oil, white wine, salt, flour, oregano. Olive oil, white wine, whole wheat flour, salt. Pack of 200g. SKU: 038. Category: Savory waffles. Olive oil, white wine, whole wheat flour, salt.